We had another great turn out for our third and final social media session at Jubilee Graduate Centre last week. We are now looking into taking this to the main campus, though we might consider merging the three sessions into a single all-day event. This may allow time for lengthier and more interactive discussion activities. View more presentations from Andy Coverdale. During the second of our social media sessions at the Jubilee Graduate Centre, I mentioned that I had recently responded to a tweet from one of my followees on Twitter. He posted a link to an article he was desperate to read but unable to access as his University wasn’t subscribed to that particular journal. I quickly found out I had access to the article through my University of Nottingham account, and uploaded it to GoogleDocs for him to pick up. For all I know, others may have responded in the same way. Interestingly, the response to this in the session was mixed. Most I’m sure, appreciated the time and effort I saved this guy; the inter-library loan service is an invaluable yet often frustratingly time-consuming provision which many of us rely on. I used the opportunity to emphasise the expectation of reciprocity in social media interactions; that I would hope others would do the same thing for me. Perhaps the uneasiness evident in some of the responses was a natural reaction to the way this small, virtually insignificant act represents one of the ways social media challenges traditional channels of academic access to knowledge. And the recognition that we all influence, and depend on, the complex socio-economic structures that bind Higher Education and academic publishing. I have embedded this video rush of an interview with Stephen Fry – made as part of the BBC TV series The Virtual Revolution – more for what it represents than for its content. That’s not to say Fry’s typically eloquent defence of the Web is not worth a viewing. But this is, I believe, the first time the BBC have released video content and code in this manner. * This and similar rushes have been released under an international permissive “Share-Alike’ licence (inspired by, but not identical to, the Creative Commons Licence), and form part of an impressive looking Web resource. Whilst this experimental move is clearly designed to align open-access/code sensibilities with a promotional ecxercise, lets hope it points the way to further commitment in this area. The video can also be downloaded and comes with a full transcript. * This service may not be available to users outside the UK. 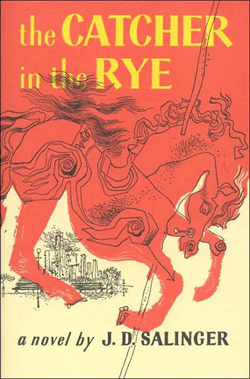 The death of J D Salinger this week gave me an excuse for digging out my old copy of The Catcher in the Rye. It’s a few years since I last looked at it but, along with Vonnegut’s Slaughterhouse-Five, it’s probably the novel I’ve re-read the most. Indeed for several years it became a bit of a ritual to read it on my way home for Christmas, in homage to Holden Caulfield’s narrative.